Picking out something to wear on a travel day can be stressful – especially if you have just packed everything up! It is important to look nice when traveling so here are a few tips and thoughts that I hope will help you get ready to travel! Choose colors that will help put people (and yourself) at ease. We now know that color affects us subconsciously in a big way, that what we wear DOES have an effect on our own minds and to those around us. I have a light orange maxi skirt (pictured above) that is super comfortable. The orange increases oxygen supply to the brain, produces an energizing effect and stimulates brain activity. Pairing it with a grey sweater (which calms) and a light blue bag (blue soothes and positively affects mental clarity – this puts people in a better mood) are the perfect combination for a peaceful trip. These 3 colors are great together for travel. Greens and turquoises, any shade, are also great colors to travel in as it is the easiest color on the eye and can in-fact reduce fatigue. Slip-on shoes!! A nice pair of flat slip-ons is best. Most airports have you remove your shoes to go through security so you will definitely save some time (and hassle) by wearing slip-ons! Easy on – easy off and comfortable enough if you have to move fast! If you wear them with no socks, be sure to throw a pair of socks into your carry-on for a flight in case your toes get cold! Layers! Always layer it up as you never know if it is going to be too hot or too cold. Start with a tank top, then a shirt with sleeves, then a sweater and lastly wrap a pashmina around you – the pashmina can be used as a pillow if necessary or as a wrap if you are freezing! 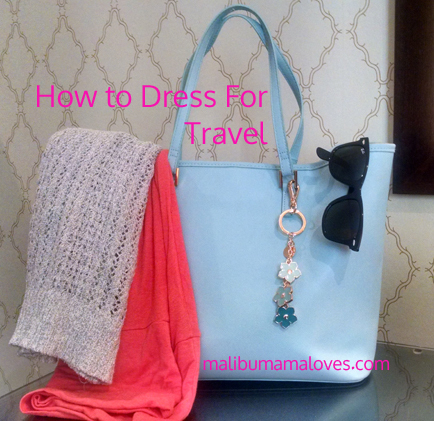 What are your great tips on how to dress for travel?